TYPE AND USE: Deciduous shade tree with edible nuts. PLANTING METHOD: Transplants. Walnut trees can be planted bare rooted or from containers. They can also be planted from seed. SEED EMERGENCE: Seeds will germinate from a fall planting or a 60-120 day cooling at 34-41° and spring planting. GROWTH HABITS: Walnut trees have an open branching character, large common leaves, dark bark and yellow fall color. Moderate to slow growth. TROUBLES AND SOLUTIONS: Roots and leaves produce a harmful toxin that hurt other plants especially garden plants like tomatoes. The solution is to keep the walnut tree out to themselves. HARVEST AND STORAGE: Gather the nuts in the fall when they release from the tree. Store the nuts in a dry cool place prior to use. Our native black walnut which is the only one that grows here has an extremely hard shell that has to be broken with a hammer or driving over a board over the nuts. The meat is delicious if you can get it out. NATURAL HABITAT AND PREFERRED SITE: Black walnut is native to eastern third of Texas, likes deep rich moist soil, does fairly well in the acid sandy soils of east Texas, likes calcium soils. It likes moist soil. It is fairly well adapted to a wide range of soils from sandy to heavy clays in much of Texas. It does not like growing on thin soils on top of limestone rock. IDENTIFICATION INFORMATION: Walnut is an upright deciduous tree with yellow fall color, large compound leaves and dark gray to black, heavily textured bark. The tree has an open branching structure. Squirrel damage to black walnut. Notice the perfect symmetry of the work. FLOWERS AND FRUIT: Flowers are male and female on the same tree (monoecious), not showy. Fruit ripens in the fall, September through October, solitary or clustered. The husk is yellowish- green, thick and contains an extremely hard bony dark brown to black nut. The husk does not split open when ripe. The meat is sweet, edible and nutritious. BARK: Dark and smooth when young but becomes very dark, heavily fissured and alligator looking with age. FOLIAGE: Leaves are compound, 1 to 2 feet long, light to medium green, deciduous, yellow fall color. Leaflets are more evenly sized than pecan and hickory leaves. There will be from 11 to 23 leaflets per leaf. CULTURE: Relatively easy to grow in deep soils that have plenty of moisture and good drainage, tolerates alkaline soil but prefers a neutral soil. PROBLEMS: Stress related to dry weather and dry soils. Walnut is allopathic to nearby plants. The substance responsible is called juglone, a tannic acid. It prevents the growth of seedlings including other walnuts from coming up near the parent tree, especially damaging to plants in the nightshade family. Solanaceae, such as tomatoes, peppers, potatoes, and tobacco. Black walnut sawdust has been used in the past to treat fire ant mounds and a brown dye can be obtained from the husk of the fruit. Black walnut is also capable of causing skin rashes to sensitive people. PROPAGATION: Nuts should be gathered in the fall or early winter after the husks have begun to turn black. They can be eaten or planted. Dormancy can be broken by cold stratification for 60 to 120 days at 34 to 41 degrees. Listeners have reported that black walnut can be germinated by planting immediately after removing the husk by simply mashing the nuts into garden soil with your foot. Sounds easy and worth a try. Improved selection and cultivars of walnuts are propagated by grafting and budding onto established root stocks. INSIGHT: Walnuts are hard to shell, but worth the trouble because the meat is delicious and full of nutrients. 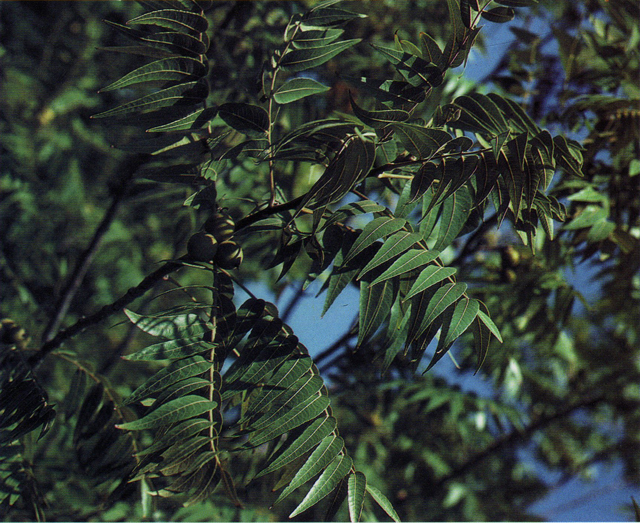 Juglens regia is the English walnut, native to Europe, not well adapted here in Texas although it does fairly well under an organic program, especially in sandy acid soil. Juglens microcarpa is the little walnut, also referred to as Texas Walnut, Texas Black Walnut, River Walnut, Nogal, Namboca. The little walnut is a multi trunked small tree growing to about 30 feet. It adapts easier to various soils in Texas and should be grown more than the regular black walnut. The nuts are smaller only ½ to ¾ inch in diameter, but have very high quality meat and excellent taste. All walnut leaves and fruit are strongly scented when bruised. Wood of walnuts is highly desirable for use in furniture construction, cabinet work, veneers, gunstock and other products.